Change is a constant. At Heroku, we often deliver important information to users about changes and events on the platform, their apps and their accounts. We use a variety of media to keep users informed about these changes, including email, Twitter, the changelog and the blog. To help provide more direct and relevant information, we've added a new feature to Dashboard called Notification Center. We'll be using the Notification Center to keep you informed of important events affecting you and your apps. When new notifications arrive, you'll see a badge in Dashboard's header. 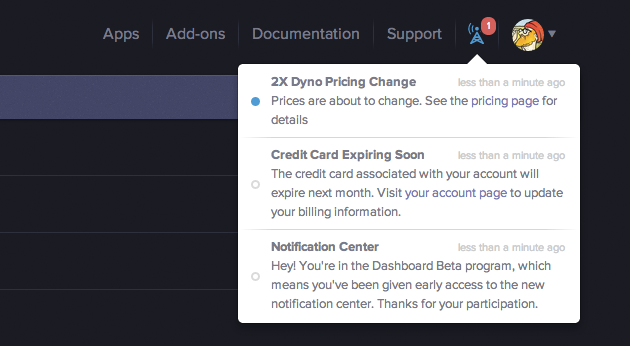 Billing changes such as 2X Dyno pricing going into effect. New platform defaults that affect your applications. Important framework security vulnerabilities that affect your apps. Account alerts, such as expired credit card information or overdue invoices. Changes in add-on state, such as an add-on you're using leaving its beta phase. We hope you enjoy having notifications available on Dashboard. We're always looking for better ways to keep you up to date with changes that affect your apps on the platform, so let us know where we can help you out.